The HP Z2 Mini G3 is a fantastic, compact workstation that packs more than enough of a wallop to be considered an impressive workplace module. But is it enough to replace your current bulky desktop? Let’s take a look and find out! The Z2 Mini G3, as you can see, is tiny. It’s sleek, stylish and seemingly innocent – but it’s far from it. This tiny work station packs a punch. With a depth of 2.3 inches and a weight of a mere 2kg it more than earns it’s ‘mini’ status. HP stated it’s as much as 90% smaller than your regular tower workstation. It’s boxy but stylish design the mini G3 can be hidden away anywhere in the office at a vertical, horizontal or even hung and attached position. Simply linking to any monitor at home or at work. In terms of productivity the Z2 Mini G3 did not disappoint. 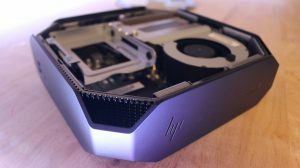 It may be far smaller than your standard desktop, but the performance we witnessed wasn’t in any way compromised by this and the G3 worked like a trooper. The HP Z2 Mini G3 comes with an array of ports one side features two USB 3.0 ports and an audio jack whilst another side showcases a GbE port, three Display Ports and a further two USB 3.0 ports as well as the power socket. Other models of this device also give a further Display Port and also 2 USB type C ports, however this edition does not. Accessing the workstations internals is as simple as the flick of a switch and lifting the lid. We can see the Intel Core i7-6700CPU processor, the internal fan lifts up to reveal two 8GB DDR4 memory cards, the build in graphics card and built-in Bluetooth 4.2. There’s also the space in a purchased model that would feature the SSD hard drive, however in this sales model features the casing in which it is held. With quoted 4K capability we tested it out alongside our Phillip’s 4K monitor and the results were breath-taking. Yes, loading took a little longer than your standard 1080p HD, but this is to be expected with 4K streaming. Whilst this isn’t a gaming PC and is aimed largely towards the business man or woman, we could help but give it a whirl. The HP Z2 Mini G3 ran 4K games at a rate of 30fps with no stall times and not a single moment of screen buffering. The picture remains clear and crisp throughout. We tried out mainly Valve’s Portal 2, a fantastic game I’d once played via console and playing it at a 4K standard through Steam gave me a reminder of a great game on an even greater machine. Ok, so back to business – The Mini G3 work station loaded and ran Adobe programs swiftly and smoothly, so for any avid designer, editor or videographer this station remains one to consider. In terms of office programs the HP Z2 Workstation runs multiple and is compatible for any Office 365 subscriptions – meaning there is work to the play also. 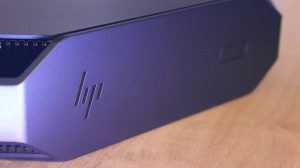 Visually, the HP Z2 Mini G3 Workstation is compact and quirky, it’s small box design makes for easy placing; however, you wish to use it alongside your monitor. It’s powerful and offers graphics paralleled with towers much larger and pricier than itself. It’s true there is no CD slot, but we soon learned to cope without the floppy-disk did we not? I’m very impressed with this workstation. The model we looked at comes in at around £1070 on Amazon, so it’s true it’s not the cheapest, but as a PC for CAD users, it’s worth the price.